We’ve treated 4,000 patients with the more easily diagnosed “hyperactive” form of Attention Deficit Disorder known as ADHD, and 3,000 patients with the less obvious quiet or so called “inattentive” form of ADD. There should be less focus on psychological labels like Attention Deficit Disorder and more focus on the underlying brain physiology that causes ADD symptoms. The arbitrary label of ADD is confusing and disenfranchising to ADD patients. Our clinical research has proven ADD patients are so much more intelligent than they realize, they simply can’t focus their smart brain well enough to utilize their high IQ. What are ADD / ADHD Symptoms? Patients who exhibit ADD symptoms suffer from an underactive prefrontal cortex, the brain region behind the forehead. The prefrontal cortex is the executive center of the brain. It provides top-down management to every other brain region. In fact, the prefrontal cortex distinguishes us from other mammals in that, when functioning properly, it prevents us from acting solely on our emotions. The prefrontal cortex modulates the high and low feelings produced in our emotional center so we don’t live on an emotional roller coaster, over-reacting to negative or positive events on an hourly basis. The prefrontal cortex is also responsible for assisting our ability to formulate a plan of action and for enhancing our ability to execute the plan. Patients suffering from an underactive prefrontal cortex are master procrastinators; they always wait until they are “down to the wire” before they begin working on a project. Normally, the prefrontal cortex filters extraneous stimuli protecting the rest of the brain from being distracted with things that are not a priority at the moment. Patients with an underactive prefrontal cortex have great difficulty with prioritization of tasks. Other functions performed by the prefrontal cortex include braking brain activity so we don’t think too fast, turning the brain off at night so we can sleep and providing impulse control so we don’t jump in first, and think about the consequences of our actions later. When the prefrontal cortex is underactive it cannot perform well at any of these functions. They often feel they cannot turn their brain off at night. Many say, “My body wakes up at 7 a.m. but my brain wakes up at 9 a.m.” ADHD patients experience “brain fog in the morning.” They often self medicate this brain fog with nicotine and coffee. Nicotine is stronger than cocaine and heroin in ability to stimulate a surge of dopamine from brain cell storage units. Most ADD patients inherit an underactive prefrontal cortex from one of their parents. Some ADD patients acquire an underactive prefrontal cortex from brain trauma and some from neurotoxicity, the excessive accumulation of neurotoxins in the brain. The prefrontal cortex is the most sensitive brain region to toxins. ADD patients cannot take the prescribed dopamine enhancement they need for their focus center until their overactive brain regions are properly diagnosed, and the cause of excessive electrical activity in those brain regions is identified/treated. Without this more sophisticated and balanced approach to treating ADD, enhancing the patient’s dopamine activity will make every one of their overactive brain regions more overactive. This will make the patient not want to take a medication that can transform his or her life. The patient will become more moody, more irritable, and often will even feel more depression. In summary, effective ADD treatment requires extraordinary knowledge of brain physiology, awareness of how the different brain regions interconnect, and the ability to simultaneously balance the electrical activity in six different brain regions. ADD patients have different personalities. Why would they all need the same treatment? Our ADD research has given us tremendous expertise in treating ADD patients. We have correlated the different personality profiles of ADD patients with the differences seen on their brain scans as compared to variations in their brain chemistry patterns. From our ADD research, we can help you better understand the different personalities, and the changes you’ve seen in the personalities, of your loved ones. We have never treated a patient who had “just ADD.” Because of changes in our landscape and the excessive antibiotics in our food supply, most ADD patients have acquired overactive brain regions in addition to their inherited underactive ADD brain region. Dopamine enhancing medications like Vyvanse work well for stimulation of the underactive prefrontal cortex in ADD patients, however, these medications increase electrical activity throughout the brain, not just in the prefrontal cortex. Neuroscientists at the National Institute of Health have finally proven the genetic cause of Attention Deficit Disorder. ADD patients inherit a “super” COMT enzyme. The COMT enzyme metabolizes dopamine in the space between brain neurons called the synapse. Patients with the super COMT enzyme “breakdown” dopamine much faster than normal; dopamine is converted to another inactive molecule, VMA, before it has time to activate the dopamine receptors on the sequential brain cell. Why does the super COMT enzyme affect the PFC more than other brain regions? Scientists have recently proven that the PFC has far less dopamine “recycle wagons” than other brain regions. 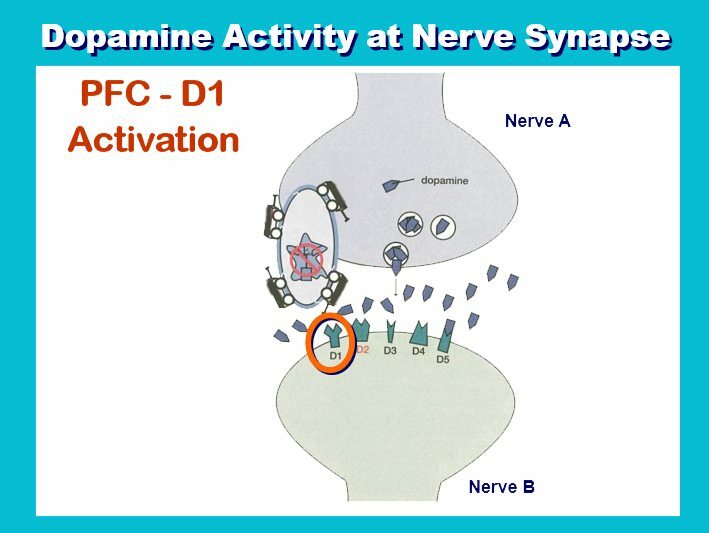 With less available dopamine transporters, deactivation of dopamine in prefrontal synapses is much more dependent on the COMT enzyme and much more affected by an enzyme that “burn” the dopamine too fast. Throughout the rest of the brain, dopamine transporters or “recycle wagons” are plentiful and their effect on removing dopamine from the synapse, far overrides any effect of inheriting a super COMT enzyme. With the advent of modern brain imaging, PET scans and SPECT scans like those below, there is no longer a scientific dispute over the reality of the ADHD diagnosis. The cause is an underactive prefrontal cortex which is represented by the dark areas seen on the brain scans below. Moving from left to right, these brain scans reveal normal brain activity in the prefrontal cortex, as compared to mild ADHD and on the far right, severe ADHD. 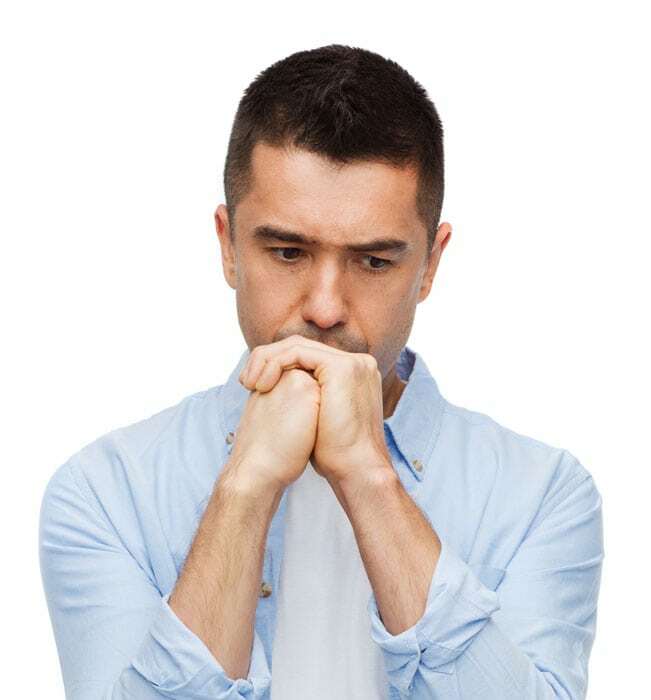 By 2002, clinical research at Sponaugle Wellness Institute had proven that ADHD is one of the most common brain disorders causing patients to “chase dopamine” through drug addiction and alcoholism. 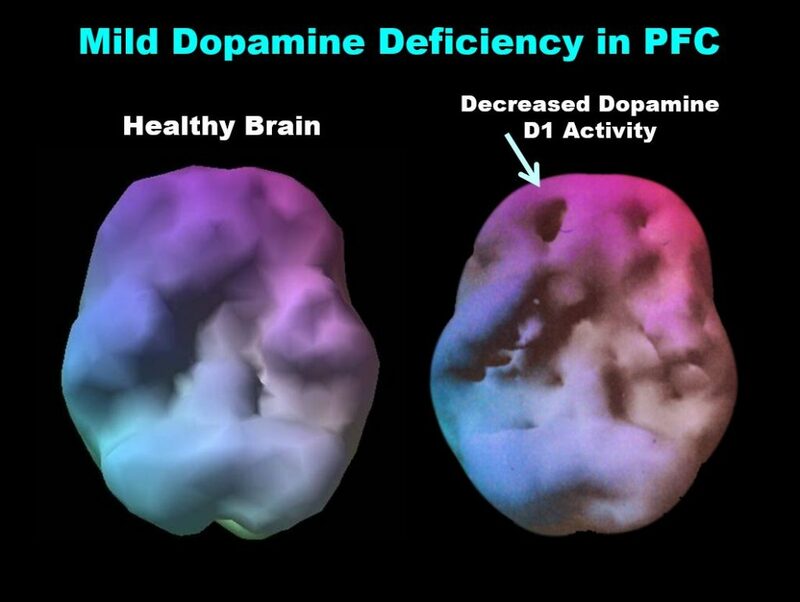 We have stopped the dopamine chase in thousands of patients by optimizing the dopamine D1 activity in their prefrontal cortex*. The National Institute of Health just released on April 3, 2013, a “groundbreaking” study in rats, stating they have proven that an underactive prefrontal cortex caused the rats to chase cocaine. Dr. Sponaugle is excited to finally get some validation of his pioneering addiction work. Very simply, patients who have inherited an underactive frontal lobe “feel more normal” when they use drugs that produce a temporary surge of dopamine from brain cell storage units. They also “feel more normal” when they engage in activities that cause an adrenaline surge. Adrenaline surges increase dopamine availability in the brain. When we optimize dopamine activity in the prefrontal cortex to normal levels by using appropriate medications like Vyvanse and correcting nutritional deficiencies that cause dopamine deficiency; we stop the dopamine chase and the “need for speed” adrenaline chase.